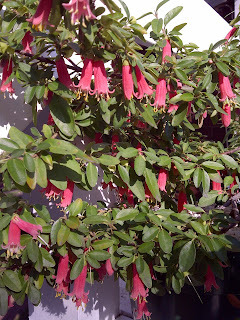 Caerulean Skies: Correa "Carmine Bells"
Correa is a lovely genus and shrub I have been growing for a few years. My fellow gardener and friend Barry gave me a cutting of this. It comes from Australia and is not hardy here in the Northern Hemisphere. I quite likes the heat and cool weather equally. In late summer you get a flush of these gorgeous fuschia pink bells. This plant will bloom until early spring in the cool greenhouse which is where it will spend its winter. This plant is rare grown or found in collections as it is difficult to come by. It is an evergreen plant which never goes dormant. The plant is probably a hybrid between reflexa and pulchella.